The current unit for science includes a bunch of stuff about erosion and weathering and dirt. The textbook talks about red soil in Hawaii and loamy soil and nutrient-rich soil and clay-rich soil. Since a field trip to Hawaii is out of the question, the pictures and text in the book is somewhat irrelevant. Instead, we went out side and looked for evidence of weathering and erosion. We walked the places that water flowed and looked at the different dirt in different areas around campus. We found places where fine particles of soil collected and we found areas with no fine soil, only rocks. We noticed the direction the water erosion took place on the grounds of our school and checked out areas for deposition. 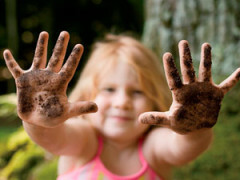 They felt the moisture-rich soil and shared the different soils in their hands. And while all of this was happening, we used the appropriate vocabulary. We noticed and wondered. We found relevance in the ground beneath our feet. We created connections between our world and the foreign language in that textbook. After a great science walk, the kids mostly owned the vocabulary. More importantly, they didn't memorize it. They experienced it.